I can’t recall a time when Mars hasn’t been represented as a hostile environment – whether it is inhabited by aliens or not. Books like War of the Worlds almost without reservation show Martians as these violent beings which want to take over our world or destroy it. But the more we learn about the red planet in outer space, the more we are all convinced that there isn’t anything there which can seriously harm us. Or is there? That’s what this week’s film review hopes to address. Ah Ridley Scott, one of my personal science fiction heroes, he created Alien, which spawned the Alien franchise. And he also directed Prometheus which is less appreciated but still a really solid film. And that’s not everything he has done. Ever seen Blade Runner? How about Thelma & Louise, Gladiator, Kingdom of Heaven, American Gangster or Robin Hood? Oh one more the commercial failure Legend, which has effectively become a cult classic and led the way for a number of fantasy flicks that have since followed? Yeah, that Ridley Scott. He combines science fiction and/or fantasy with realism and makes incredible dramas. Don’t believe me? Let’s check out part of the synopsis for The Martian. The movie starts with the crew of the Ares III on Mars. Commander Melissa Lewis (Jessica Chastain), botanist Mark Watney (Matt Damon), IT guru Beth Johanssen (Kate Mara), pilot Rick Martinez (Michael Peña), flight surgeon Chris Beck (Sebastian Stan), and navigator and chemist Alex Vogel (Aksel Hennie) are in the final stages of their expedition when a storm hits. Commander Lewis orders for the mission to abort and they all head to the shuttle, with the exception of Watney who is resistant and consequently the last one out. A satellite dish ends up knocking him away from the group and because of the intensity the crew and Lewis are forced to leave without him, presuming him dead. Back on Earth, NASA Director Teddy Sanders (Jeff Daniels) has already released information about the mission and the loss of astronaut Watney. Cut back to Watney who wakes up on Mars with the storm now over. The antenna from the dish impaled him, simultaneously wounding and sealing his suit. He is forced to remove the piece himself, and then explains the situation over a video log. He’ll be there for 4 years before the next mission visits the planet (he can’t contact Earth), and with the remaining food he has to make up 3 years of food. If he can grow this food he’ll make it. Good thing he’s a botanist. Back on Earth Sanders has come back from Watney’s funeral service where we learn engineer Mindy Park (Mackenzie Davis) has satellite photos of the Ares III site, which show the rover has been moved and the solar panels are clean. Sanders and Director of Media Relations Annie Montrose (Kristen Wiig) agree that Watney is still alive. A few days have passed on Mars already and Watney has now planted potatoes in the tent using Martian soil, some of his food, and fertilizer (vacuum-sealed feces from the crew). He then figures out how to make water by burning off rocket fuel. Now that he has the basics to survive he determines that he’ll need to modify the rover to make it to the crater where the next landing will be. By digging up a Pathfinder probe, Watney manages to recharge it using the probes solar panels and learns that it still works. He works out a system of hand written signs and sends a message to NASA. The team at the Jet Propulsion Lab (JPL) who built the Pathfinders, recruit members of the team that engineered the machines, pull one of storage, and set up a system to “speak” with Watney by pointing at “yes” and “no” signs. They quickly change tactics and set up a hexidecimal clock to communicate more easily. From here the team teaches Watney how to hack the rover, so that he can type and receive written messages. The first question he asks is about the crew and how they took the news. When he learns that the crew still doesn’t know, the whole world gets to see his profanity laden response. After some media attention and direction from PR Director Montrose, Watney is advised to make his rations last for 900 days. Then the terrible happens and the airlock on his habitat explodes backward, rattling him around and cracking his helmet. Watney manages to use duct tape to seal the helmet before he discovers that his crop is now frozen and dead. He can now only last about 300 days. And the movie only gets more nail-biting from there! Pros: The movie makes science both fun and exciting at the same time. 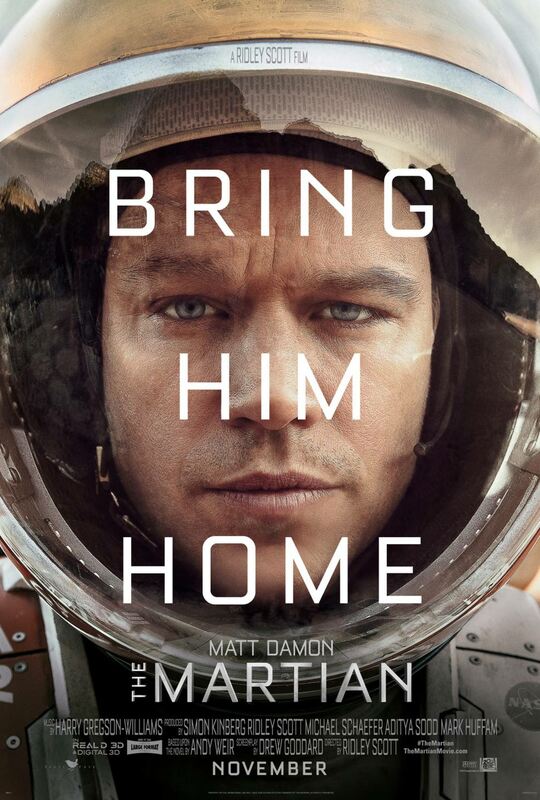 Matt Damon is perfectly suited to play the role of The Martian. The supporting cast all make the story thrilling and while the science isn’t perfect (according to my physicist brother), it’s pretty damn close. Cons: The relationship between Watney and his crew feels somewhat stressed and unauthentic at points, and the NASA preachiness does bubble up on occasion. The other challenge comes from following cliches, you know where the story is headed, but that’s a minor detail. Points of Interest: If you believe in method acting, Matt Damon spent the rest of his schedule on solo scenes, which took five weeks of straight shooting. He didn’t see the rest of the cast until the film was cut and ready for promotion. That was a real potato farm set up in the studio, included at various stages of the growth cycle. Whether there is life on Mars or not, you can be sure that we will continue to see films made about aliens and the possibilities available in the universe, at least until we’ve become better space explorers. And I would have to agree with him. Much like the ocean, wilderness, and city have all held myths and legends over time, we now look to space as a curiosity which no one can claim to be an expert. Having mentioned this, I think The Martian is a great exploration of the possibilities ahead, and whatever your opinion of space, you’ll enjoy the humanity of this story. See you tomorrow for some wisdom! I agree, moreover, I’m not really sure how anyone could take against this film. It has all the elements; the sense of adventure, survival, humour and a good sense of humanity. Plus, it’s great to see Ridley Scott getting plaudits, again.